This summer Together returns to Ibiza’s Amnesia for the fifth successive year to host possibly one of the most diverse weekly parties on the island, with Defected In The House joining them on the Terrace. An apparent successful 2014 witnessed a series of parties featuring dozens of the biggest names in electronic music. Chase & Status held down a weekly residency, whilst artists such as Skrillex, Diplo, Gorgon City, Sigma, Example, Sub Focus, Ben Pearce, Andy C, Hannah Wants were all amongst the line ups. With the full line-ups still to be announced, Defected In The House will be joining them on the Terrace for 16 consecutive weeks. 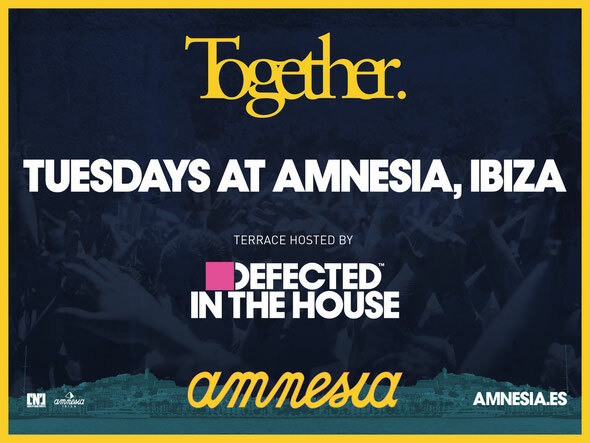 Having previously held residencies at Pacha, Booom and El Divino, Defected takeover the Amnesia terrace at Together every week to showcase the very best in house music.